Happy Monday!! How was your weekend? Did any of our lovely readers take part in the London Marathon this weekend? We’d love to hear your story if you did. 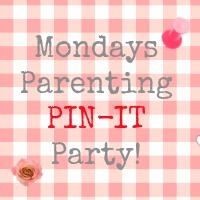 This week we have the beautiful Carolin from Mummy Alarm hosting this week’s Parenting Pin It Party and, with a bank holiday weekend looming in a few days, we would love to see some posts with tips on what to do and where to go. Please add the host badge to your page as well. Sign up to the mailing list as well; do.